« Would You Say That To a Friend? Around this time several years ago, I was packing for my trip to Greece. I loved the food, ambiance and feel of the country, and especially their relaxed, fun approach to eating. As many of you already know, I cruise recipe blogs, websites, and magazines and enjoy exploring new ventures in cooking and eating. Here’s a wonderful new recipe from one of my favorite blogs, Stranded Foodie, for these warm, summer days. Definitely brings back fond memories of the Greek isles. Enjoy! Whisk together the lemon juice, cumin, garlic and some salt and pepper in a small bowl. Slowly whisk in the oil until emulsified. Let sit at room temperature while you prepare the salad to allow the flavors to meld. Rinse the quinoa in a strainer until the water runs clear. Combine the quinoa, 2 cups water, 1 teaspoon salt and 1/4 teaspoon pepper in a small saucepan, bring to a boil and cook until the water is absorbed and the quinoa is tender, about 15 minutes. Transfer the quinoa to a bowl, fluff with a fork and let sit for 5 minutes to cool slightly. Add the tomatoes, olives, green onions, cucumbers, parsley and beans. Add the dressing and toss to coat. Taste and season with salt (if needed) and freshly ground pepper to taste. 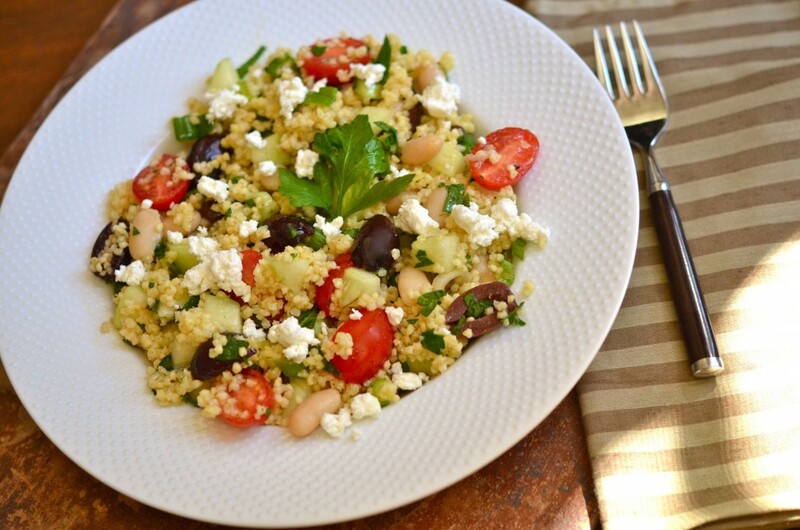 You may not need additional salt because the feta cheese adds a nice salty taste to the salad. Squeeze more lemon juice over salad if you like it lemony. Mmmm! Cover and refrigerate for at least 1 hour and up to 8 hours before serving. The longer it sits the better the flavor. Just before serving, transfer to a bowls or platter and sprinkle feta on top and garnish with parsley.